Like most screenwriters, I can assure you that the process is much more enjoyable if you've cast an actor in your mind who is saying the dialogue you're typing onto the blank page. 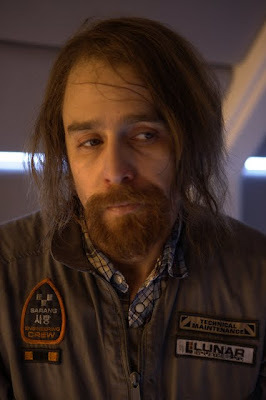 Yet, while most of us write with the dream of our ideal cast bringing the moments we're creating to life, Duncan Jones was a screenwriter on a mission to not only write a film for Sam Rockwell but ensure that the actor would star in his feature length directorial debut. Having met the actor to discuss a different script altogether and realizing that their visions for the project were contradictory, Rockwell told Jones that if he ever had a science fiction script on the horizon, he should get back in touch with him. 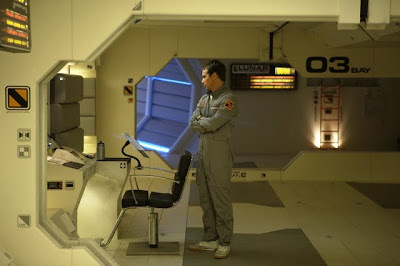 As Jones explains in one of the fascinating behind-the-scenes Blu-ray featurettes included on Moon, Jones left the meeting and began crafting what I personally feel is the script of a lifetime for one of our greatest and most underrated actors. While Rockwell has always been one of our best kept secrets, working steadily yet always on the cusp of fame in both independent and Hollywood productions alike, Moon became a 2009 instant Donnie Darko or The Matrix style cult classic, uniting fans and Rockwell's colleagues who embarked on a passionate grassroots strategy to at least ensure that his work would be considered for an Academy Award. The product of online gossip and outrage, Moon was suspiciously absent from the “for your consideration” screener pile mailed out to Academy voters and critical organizations at the end of 2009 with Sony Pictures Classics' reference that due to the high cost of copy-protection and risk of piracy, they only sent out a couple of titles from the studio. Yet with Duncan Jones, fans, and those working in the industry all signing online petitions and helping to spread the word to ensure what is easily Rockwell's most challenging and intense role to date is given its just due, I became more determined than ever to track it down for review, especially after realizing that the film was largely overlooked at my organization of the Independent Spirit Awards as well. Having missed the movie during Moon's extremely brief art-house run, I was thrilled to explore the truly innovative independent science fiction film that Jones created on Blu-ray. 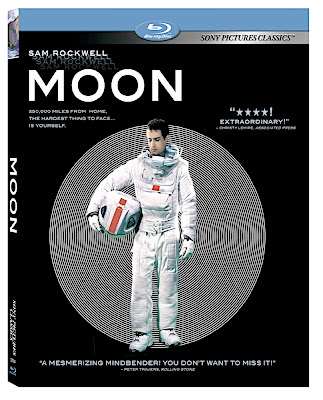 More than some of last year's other critically acclaimed titles, Moon is one in particular that demands high definition to best appreciate the nuances in Rockwell's performance, which serves as a fitting metaphor as a raw, real, natural man filmed opposite the man-made enhanced world of green-screen technology. 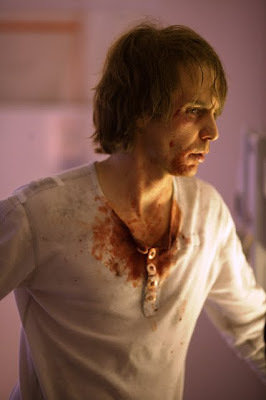 Using several different techniques to bring Jones's vision to celluloid, Moon itself was shot on a fully built set at the legendary Shepperton Studios that heightened the film's sense of claustrophobic isolation. 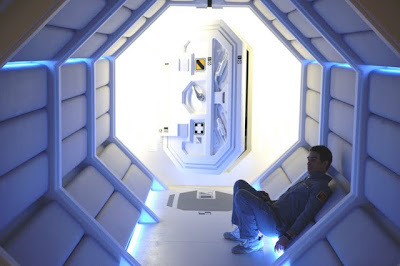 Taking a topical issue of our energy crisis and using it as a dramatic jumping off point, the movie begins as Rockwell's astronaut Sam Bell is wrapping up a solitary three year mission harvesting fusion energy at a mining base on the moon. With only a computerized robot ally named Gerty (voiced by Kevin Spacey) as his sole companion and no way to interact with those back home since the satellite is down, Sam has no choice but to view incoming messages from his wife and daughter and watch "stress-free" television like Bewitched and The Mary Tyler Moore Show while working on a model village and waiting for the clock to tick. 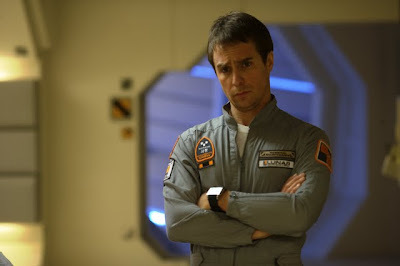 Our first impression of Sam is one of alarm as the emaciated, insomniac and irritable astronaut looks as though he'd been awake for nearly three years in a prison based solitary confinement instead of one in the space program. Yet just as he's getting ready to head back home and prepare the base for the arrival or the next man's three-year contract, Sam makes a startling discovery after he's involved in an accident on the moon, The mishap causes an interruption in the usual chain of events, which takes viewers and Sam on one hell of a psychological odyssey as we're forced to ask just what we believe, what we're seeing, and what the human body and mind is capable of creating and surviving. 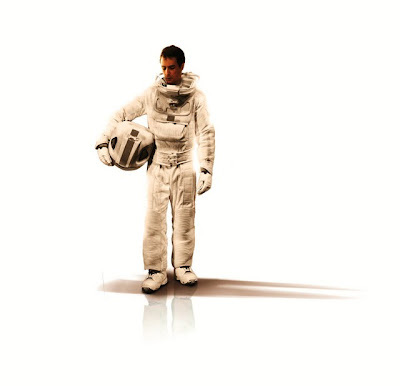 A thinking man's science fiction work, Moon is sure to appeal to devotees of not just traditional science fiction a la 2001 and Twilight Zone but also existential tales of unreliable narrators undergoing unpredictable circumstances such as Fight Club, Memento and David Lynch's Mulholland Drive. 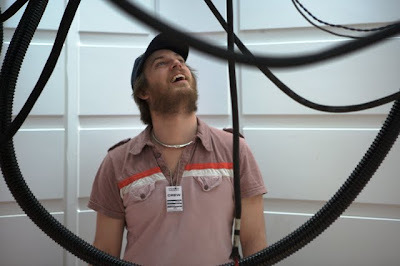 The Lynch comparison is particularly fitting because similar to Jones' effort to make sure we realize just how much the man who inspired his screenplay created a master class of acting in his debut movie, David Lynch was equally passionate about talking up the star of his experimental effort, Inland Empire. However, while Jones is using standard channels, Lynch's one-man mission to get Laura Dern nominated for an Oscar for Empire included going as far as to stand on a street corner in Los Angeles with a cow. True to form as the type of performer you understand probably relishes his certain degree of anonymity, Rockwell humbly dismisses his work with self-deprecating humor by calling his collaboration with Jones as an actor a total “mindf**k” and an “exercise in narcissism.” Yet whether or not Rockwell is remembered or once again snubbed when Oscar nominations are announced in the near future, the film is sure to stun even Rockwell's most loyal fans like this reviewer who remember his earliest work. Likewise, it's sure to make those who are unfamiliar with Rockwell eager to begin filling their rental and/or purchase queues with his extraordinary work. The type of film you'll want to watch twice and one that's doubly thrilling to screen with someone else for the sake of discussion, Moon similarly benefits from another look at Kubrick's 2001, since comparisons between the films have become a staple of Moon reviews considering the questions both raise about the nature of reality, time, and ethical issues surrounding humans and technology. Additionally, it's impressive when you realize that Jones' effort was only the filmmaker's first feature length work and one that was made as a total labor of love for his vision and creative drive to collaborate with the man who inspired his screenplay. Therefore, while you're attempting to track down the Rockwell Oscar petition, you may want to go ahead and do the same for Jones since this auspicious debut raises the bar high above the moon as we anticipate what he'll come up with next. With this in mind, for his next project, might I suggest that Jones and Rockwell take another meeting?